This Lady and the Unicorn Series II tapestry shows the Lady with three senses, of the six senses including love, portrayed by this series. Here we see the senses of Smell, Hearing and Touch. Also known in French as L'Odorat, L'Ouie, and Le Toucher, we see the Lady smelling flowers handpicked by her hand maiden, playing the pipe organ, and touching the horn of the unicorn. She is accompanied by the regal lion, and the unicorn, in a mille fleur or thousand flower background to decorate the scene. The flag of Le Viste, nobleman of the court of King Charles VII, is seen flying on a flag pole, to commemorate the dedication of the work to jean Le Viste. This large unicorn tapestry Lady and the Unicorn Series II is backed with lining and tunnel for easy hanging. Note: tapestry rod and tassels, where pictured, are purchased separately. 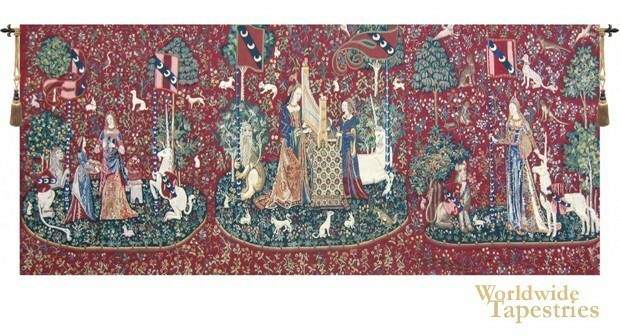 See a larger, detailed image of the Lady and the Unicorn Series II tapestry here. Dimensions: W 156" x H 66"